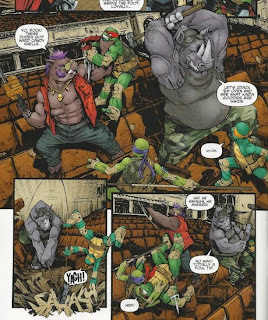 In the old theater, the Turtles and Splinter are getting thrashed by Bebop and Rocksteady. Shredder demands to know who these mutants are and Karai claims them, informing him that she had them created in secret to serve the Foot. Things look bleak until April shows up, equipped with Harold Lilja’s armaments (intangibility shield and anti-gravity gauntlet), burying the mutants in debris. Enraged, Shredder tries to rally the catatonic Dark Leo to fight for the Foot. Splinter tells Shredder to step away from his son. In the parking lot, Casey steps up to his father, Hun. Hun tries to convince Casey that he’s a changed man, and by taking control of the Purple Dragons and joining the Foot, he can fix things between them. Enraged, Casey breaks his baseball bat over his father. Hun isn’t fazed, but rather he’s impressed by the fight his son is showing. Unfortunately for Casey, he split his stitches in the swing and Hun implores his son to surrender. Angel hits Hun with her tonfa and the Dragon gets ready to kill her in response. Luckily for our heroes, Old Hob has revived from his gunshot wound and found a rifle. He shoots Hun in the arm before Slash shows up and hurls Hun against a car, knocking him out. Back in the theater, Dark Leo rallies and throws down with Raph. Raph disarms his brother and gives him a pep talk, assuring Leo that what he’s doing is not of his free will. After seeing another vision of Tang Shen, the words finally penetrate and Leo begins to recognize his family again. Meanwhile, Shredder topples Splinter in battle. He accuses Hamato Yoshi of betraying the Foot Clan and refuses forgiveness. Before he can strike the finishing blow, Alopex pounces on him. She wants revenge against the Shredder for slaughtering her family. She’s about to slash Shredder’s throat when Karai nails her with an arrow. April warns that the batteries on her gadgets are running out and she can’t keep Bebop and Rocksteady subdued much longer. 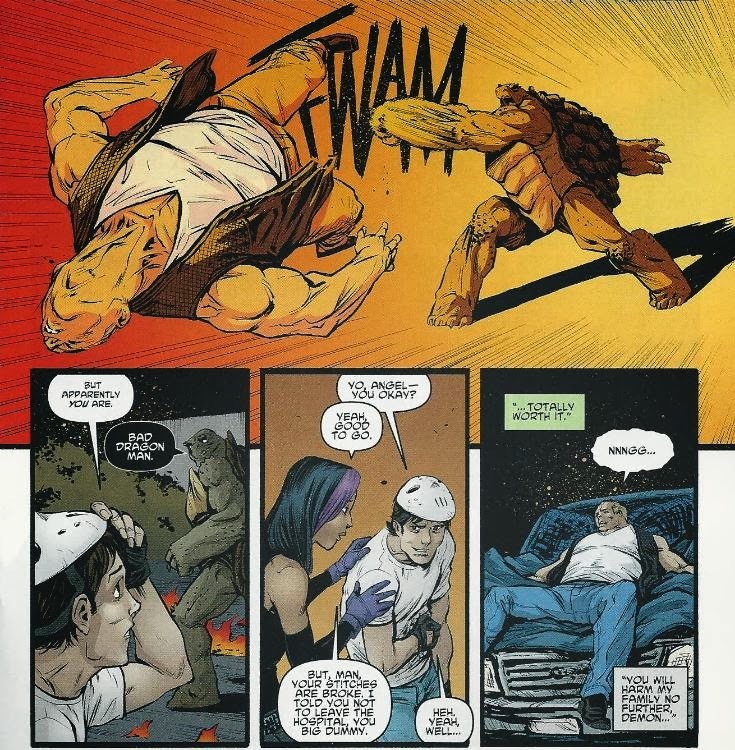 Slash makes a new entrance through a wall and the Turtles and Splinter bail. Hob pulls up in his pickup truck and carts them all away as Bebop and Rocksteady give chase on foot. Hob has a grenade handy, though, and crushes their momentum. Hun, recovering, watches as Casey leaves with his “new family”. Later, at Foot HQ, Antonio gives his tribute and loyalty to the Shredder. Shredder assures him that their business partnership will be mutually beneficial. After the mobster leaves, Shredder beckons Karai over for a private conversation. He accuses her of treason for creating mutants without his consent and that the consequence is death. Karai vows that what she did was for the good of the Clan, but submits to her punishment with honor. Rather than kill her, Shredder commends her and promotes her to Chunin. Walking to the balcony to join Kitsune, Shredder explains the intricacies of his scheme. He used Leonardo to gain a psychological hold over the city. As citizens were currently in a state of fear regarding mutants, being seen to control a mutant gave him an edge. He also promoted Leo over Karai as a test to see how truly loyal she was to the Foot. Shredder says that family is not a birthright, but something to be earned. Karai has earned her place at his and Kitsune’s side. Outside the city, the group parts ways. Angel has to go back to be with her dad in town, but wishes Casey a speedy recovery. Leo recoils from Splinter and gives the black bandana back to Slash. April says she knows a place they can go and the Turtles, Splinter and Casey pile into her van. 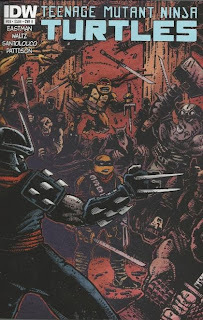 *This story is continued from TMNT (IDW) #27. 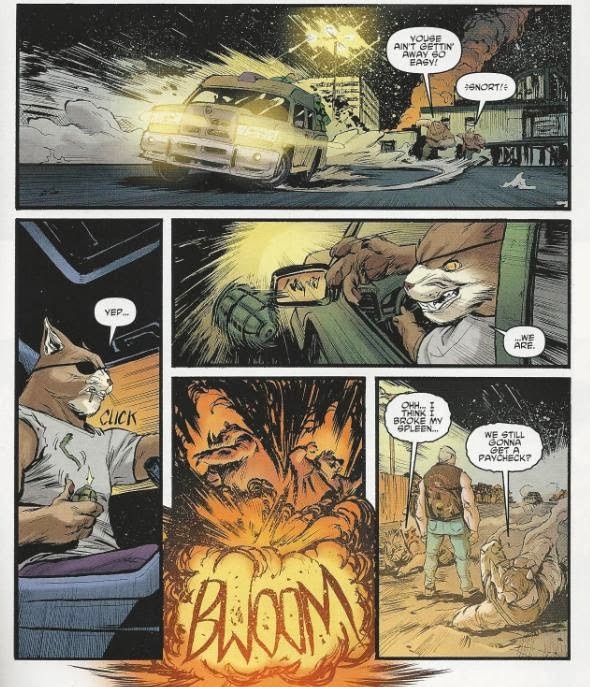 The story continues in TMNT (IDW) #29. *The events of TMNT Villains Micro-Series #8: Shredder take place between this and next issue. *This issue was originally published with 5 variant covers: Cover A by Santolouco, Cover B by Eastman and Ian Herring, Cover RI by Nick Pitarra and Megan Wilson, Cover RE Jetpack Exclusive by Eastman, and Cover RE Jetpack Exclusive bandanas and Foot Clan symbol. “City Fall” is over and I’m left feeling rather conflicted about it. This was a BIG story. Add in the prelude and the issues of the Villains Micro-Series that supplement it (one of which isn’t out yet, but it’s the epilogue) and you have an epic 14-part story. FOURTEEN. That’s a pretty big story. “City Fall” is the culmination of a LOT of plot threads that have been gestating for years. These storylines were almost like shackles in the back of your mind, chaining the narrative down. IDW could keep moving forward with the story, but there was always that voice saying, “When are they going to get to this? When are they going to address this again? They set this up two years ago so when is it going to pay off?” Now that all those shackles have been unlocked, it feels like the book is free to go and do whatever it wants. That’s a good thing. IDW’s TMNT had been burdened with an excess of story and they were piling new plot threads on before they could even get to the old ones. It was getting cumbersome and I was finding myself forgetting about threads and events because there was just way too much to keep track of and nothing was getting resolved. “City Fall” knocks all of those lingering elements out in rapid fire succession in a huge explosive event and the weight has been lifted. BUT, that comes at a price. It also means that “City Fall” had to cover a LOT of ground. There was just SO MUCH story to tell that the 7 chapters of the ongoing just weren’t up to the task. So we got over half the Villain Micros to pick up the slack. And even with them acting as “breather” chapters there was just a lot to keep track of. At times, I think the characters fell victim to the excess of story. They had to get from one set piece to another and get the next act moving and then it was off to the next set piece and the next act and so on and so forth. The characters were all THERE, but they were diluted versions of themselves; strictly vehicles to keep the story moving before time ran out. And that’s why I think “City Fall”, were it not for the Villain Micros, would read rather blandly. And I don’t envy those who are going to be picking up the “City Fall” trades which won’t be including the Micro-Series chapters. THAT’S where all the characterization is (not to mention a number of absolutely vital plot points). With just the ongoing by itself, Alopex is a henchwoman and nothing more; her glimmer of character came in her Micro. Without the Micro, Karai is just a resentful stooge upset about missing a promotion; the depth of her character and her set of values came from her Micro. Hun is just a guy lusting for power; everything about “wanting to improve himself and put away his demons” came from his Micro (save for him summarizing things in this issue for a clunky speech). The ongoing series simply cannot be read in a vacuum, at least not at the “City Fall” juncture. All the vital characterization that makes these players more than just two-dimensional mouth pieces for dialogue necessary to get from Point A to Point B… That can only be found in the Micros. In a way, it creates two very different reading experiences. Those reading just the ongoing are going to come away thinking these characters are very thin, their motivations spontaneous and ill-defined and that the story is nothing but action without any personality to it. But those reading BOTH titles, getting the full experience, end up with something much more fulfilling. Suddenly Karai is more than a spoiled brat, but a character that only wants the best for her family and her heritage. Suddenly, Alopex isn’t a brainless attack dog, but a victim who lets her sense of loss and need for revenge get the better of her. Suddenly, Hun, a giant power-hungry gangster, desperately wants to make good with his son and undo the years of neglect and abuse he inflicted upon him but in the only way he knows how. But if all you’re reading is the ongoing, you aren’t going to get that impression. And it’s a conflicting thing for me, because I can’t claim the IDW series is failing in its characterization, because it’s not. However, it’s been so crippled with storyline overload that it has needed a supplementary series just to MAKE ROOM for the characterization. And that IS a problem. The stories should serve the characters, not the other way around. But like I said, now that “City Fall” is over, and so are the Micros, maybe the ongoing can spend a little more time with its cast so those out of the Micro-Series loop can get to know them again. Hrm. And that brings me to another subject. While I believe “City Fall” succeeded in telling a big story that fulfilled the lingering promises of the past two years, there was one aspect to it that fell utterly limp. I’m sorry. It just didn’t work. Maybe it was the way IDW solicited the next arc months in advance, cutting the suspense out from under the Dark Leo conflict by telling us EXACTLY when he was going to return to the good guys. That was a problem. But it was more that Dark Leo just didn’t seem to have a point. I mean, what do YOU think the intention of the Dark Leo subplot was? To fill Leonardo with regret for the wrongs he committed during his tenure with the Foot Clan? But WHAT wrongs were those, exactly? What evildoing did Leo commit that will haunt him for the rest of his days? Accessory to murder? Larceny? Assault and battery? It just doesn’t add up to something so dire it would force him to feel like he totally betrayed his family and recoil from their love and support. But I guess you all can guess where I’m going with this. Dark Leo didn’t kill anybody. And I think that’s where it just fell flat. 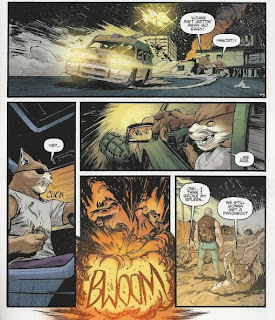 IDW’s TMNT have made a big deal about their code of honor; namely their “no killing” policy. The setup seems to be that when they DO take a life, it is going to haunt them and hurt them and burden them like nothing else. But every time we get to that threshold, the series pulls its punches at the last second and backs down. Leo thought he killed Slash, but Slash survived none the worse for wear. Leo joined the damn Foot Clan, but a plot device was crudely inserted about how “killing would break the brain-washing spell” so he was spared having to take a life. IDW keeps leading us to the big moment and then faking out rather than following through. Eventually, they may very well cry wolf one too many times. I’m not a guy who DEMANDS blood and guts and death in his TMNT books. 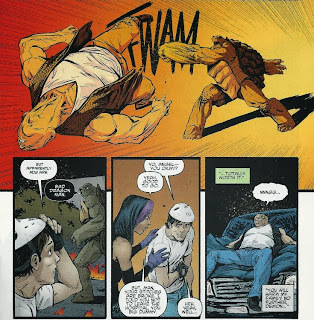 I think there have been more good Turtle stories written and told without gratuitous violence than those that have included a stabbing or three. But for Dark Leo to have paid off, Leo needed to do something terrible. Something he can never, ever take back. Victor of the Savate being captured and readied for execution seemed like that was going to be it. Dark Leo was going to kill him under the Shredder’s orders and that was the thing that would break Leo’s spirit. But no. Shredder killed Victor. Yes, they can mine Leo’s actions for drama and pathos in the upcoming stories. He joined the Foot Clan, he beat up his brothers, he helped Shredder takeover New York and he stood idly by while people died. Not things to be proud of, no, but they still lacked a punch. Leo didn’t badly injure any of this brothers. Leo didn’t stand by while INNOCENT people died (just gangsters). And Leo didn’t kill anyone. It’s just too weak to feel impactful or carry the kind of psychological and emotional resonance I know the writers were going for. And hell, in the end, as the Shredder gives his big “How I did it” monologue to Karai, he expresses the true purpose of Dark Leo: Just to mess with everyone. And as a reader, yeah, I'll agree he definitely succeeded in that regard. So that’s it. “City Fall” is over. It was a huge, bombastic epic that truly felt years in the making. However, it is not a story that can stand alone. Without the supplementary material to give the players depth, it rings hollow. If you have those stories, then you’re good to go. And if you don’t have those stories, then you’re at a severe disadvantage. Did I enjoy it, though? Yes, I did. It was a LOT of story and Dark Leo didn’t pay off for me, but it was EXCITING. Mateus Santolouco’s art was beautiful and I rarely found myself leafing through the pages unenthused. I have to agree with both of your points on this one Mark. When it was first hinted at that Dark Leo would be a thing, I felt like it wouldn't be the grand bit of story they were promising. Leonardo is a Ninja Turtle and at the end of everything when all is said and done he will go back to being a Ninja Turtle. I didn't see any of the promotional material for the books coming out after City Fall, but I still knew that once the story arc wrapped up that the status quo was going to be restored and that Dark Leo would be undone. I suppose they could have shocked me if at the end of the day they didn't succeed in bringing him back from the control of Shredder. The biggest problem that the IDW series has in my opinion is that they are always winning. Even when it looks like they are losing there is always Deus Ex Machine brought in at the last minute to not only bail them out, but to make them leave the battle with the checkmark in their win column. When you look at the end of issue 10 from the original Mirage series and the fact that they had to run because it was the only option, since their home had burned and one of their own was at death's door. There is no other way to look at the events that take place in that issue as a loss and that in turn adds a weight to the events which happen while they are in North Hampton. They are broken and they need to rebuild themselves and that is just what the do. IDW world they caused a major strike against their enemies, got back their kidnapped brother, and nobody on their team truly got hurt. True Casey's stitches opened, but his wound is from the first issue not the last and its emotional resonance has already been felt. Going into their North Hampton Arc IDW doesn't have that same weight that mirage initially did and personally that bothers me. On the subject of the Micro-series. Putting all of the meat into them made me less excited for the on-going issues. I still went and bought them each week they were released and read them that same day, but at the end I found myself unfulfilled. While on the other end of the spectrum the Micro-series always left me wanting more. That just doesn't gel in my mind either. I should be wanting more after each issue of the on-going and feel blessed that I can find some sustenance in the additional titles they release. That said the Micros truly were amazing, and thus the on-going issues seemed to be at their best when revisiting moments from them. Especially in this issue when Rocksteady and Bebop acknowledged that they had fought Raph before way back in the very first micro series. That is the kind of attention to storytelling I truly enjoy, moments that benefit those who have been involved for the long haul. That said on the other end of the spectrum I felt having Alopex betray Shredder in this issue was a bit of a waste. Granted it was the Deus Ex Machina that was needed in order to keep Shredder from killing Splinter, and by having it set up it was probably a bit easier to swallow as an act of god. Still to not let her hatred gestate in the on-going a bit more before she showed her hand seems like such a waste. As you said it wasn't supported by the on-going arc at all so it truly felt like it came out of left field when she betrayed him in the heat of battle. Not only that but it feels like they wasted that moment between Alopex and Kitsune a few issues ago. I thought that was going to be part of a deeper storyline, and who knows maybe it will. Yet at present it feels like she is dead until we see her 6 issues from now as a member of Hob's mutant army. Sorry for the length, but I have been sitting on my City Fall feelings for the length of the arc and to read that you felt at least a bit similar in the execution caused me to let them all out. Thank you for the reviews as always and for letting me get some regarding this series out there. Dark Leo in general was a terrible concept. It's like something you'd expect to see in one episode of the cartoons, where Leo is brainwashed for an episode and turns evil...and then its undone by the time the ep ends. But in comics it doesn't really work. I could have seen the Fred Wolf cartoon doing this with Krang/Shredder kidnapping Leo to the Technodrome, strapping him down into that brain machine of Krang's, and then sending him back to Earth as their right-hand man to fight the Turtles as a diversion, while they go after some energy source to repower the Technodrome with. Man, now I wish I can go back in time to the early 90's and give this episode idea to David Wise and make it into an episode! That's about all it takes to make a great episode of the Fred Wolf show. "Come on Leo, cheer up. At least now you don’t have to wear a scarf in the summer, anymore." Dark Leo. Alopex. Shredder. Proto-Man... What is it with villains and anti-heroes who love wearing long items of clothing around their necks in battle? Seems like it might be liability if anyone ever realized those things could function as make-shift nooses. Waiting for Santolouco to return. I love this cover, he's finally free from the burdens of the City Fall template. LOL at the ProtoMan comment. Don't forget about Zero from the X series! He had a scarf too! Mikey also has a scarf... Scarfing down pizza! Hyuk-yuk-yuk!